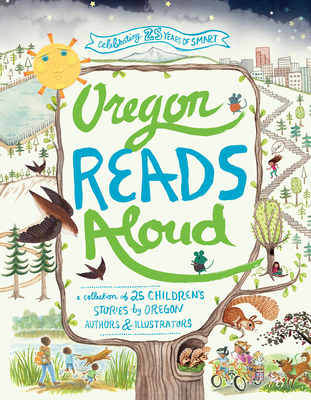 Oregon Reads Aloud is a collection of twenty-five read-aloud stories for children, written and illustrated by Oregon authors and illustrators. The twenty-five stories in Oregon Reads Aloud are a celebration of all things Oregon, including a great food cart feud, the dance of the Chapman Swifts, the creation of Oregon's mountain ranges, and a legendary African American cowboy at the Pendleton Round-up. The book is a tribute to twenty-five years of SMART's (Start Making a Reader Today) work empowering Oregon children for reading and learning success. Oregon Reads Aloud proudly features the state's rich trove of talent within the children's literary community. The contributing authors and artists are: Dale Basye, Estela Bernal, Carmen Bernier-Grand, Kate Berube, Suan Blackaby, Susan Boase, Addie Boswell, Cathy Camper, Curtis Chen, Nancy Coffelt, Carolyn Conahan, Judy Cox, Mark Fearing, Carolyn Garcia, Elizabeth Goss, Kim Griswell, Barbara Herkert, Robin Herrera, Debbie Hocking, David Hohn, Barb Kerley, Robin Kerr, Amber Keyser, Eric Kimmel, Bart King, Jane Kirkpatrick, Gesine Kratzner, Mike Lawrence, Trudy Ludwig, DamienMacalino, Helena Macalino, Abigail Marble, Natalie Metzger, Lisa Munroff, Wendy Myers, Gina Ochsner, Brian Parker, Valarie Pearce, Dawn Prochovnic, Doug Roy, Elizabeth Rusch, Linda Dalal Sawaya, Heidi Schulz, Stephanie Shaw, Cathy Stever, Sonja Thomas, Katy Towell, Zoey Abbot Wagner, and Johanna Wright. SMART is a nationally recognized, statewide nonprofit organization with a network of volunteers, educators, donors, and advocates across Oregon working together to empower children for more successful futures through books and reading. Since 1992, SMART has engaged more than 118,000 volunteers to help 180,000 Oregon students build their reading skills and self-confidence, and has given these children 2.3 million books to keep and read with their families. In 2014, the US Library of Congress awarded SMART the American Prize for Literacy, presented annually to an organization that has made a significant and measurable contribution to increasing literacy levels or the national awareness of the importance of literacy.